1643, became insolvent, and quitted this kingdom, to which it does not appear that he ever returned. When he died at Florence, in 1655, the subject of this article was about thirteen years of age; and it is most likely that his mother did not survive her husband above four or five years: for as no mention is made of lady Katharine in 1660, when Mr. Carew obtained letters of administration to the estates of the Courten family, it is probable she was then dead. In a petition to parliament, a rough draught of which is in | the British Museum, there is a like ground for the same supposition, no mention being made of his mother; for it is only said there, that he the petitioner, and his only sister, had been left for many years destitute of a livelihood. It is not said at what time this gentleman’s father sold the great bulk of sir William Courten’s lands. Even the wrecks of a fortune, once so ample, must have been very considerable, and more than sufficient for the proper education and decent maintenance of William Courten and his sister. She could very well live in those days on no more income, as appears, than 30l. per annum. That this moderate annual sum was her principal support, we are led to believe from a slight attention to two papers still in being. If he and his sister had even been more reduced in point of income than we can well suppose, they still had infallible resources in the number, rank, and riches of their relations. Their grandfather the earl of Bridgewater, two uncles, with eleven aunts on the side of their mother, and three aunts on their father’s side, were people of fortune and distinction; many of them married into honourable and wealthy families, and all of them apparently in affluent or easy circumstances. It may therefore be reasonably concluded that William Courten was well educated, though the fact were not ascertained by other testimony. 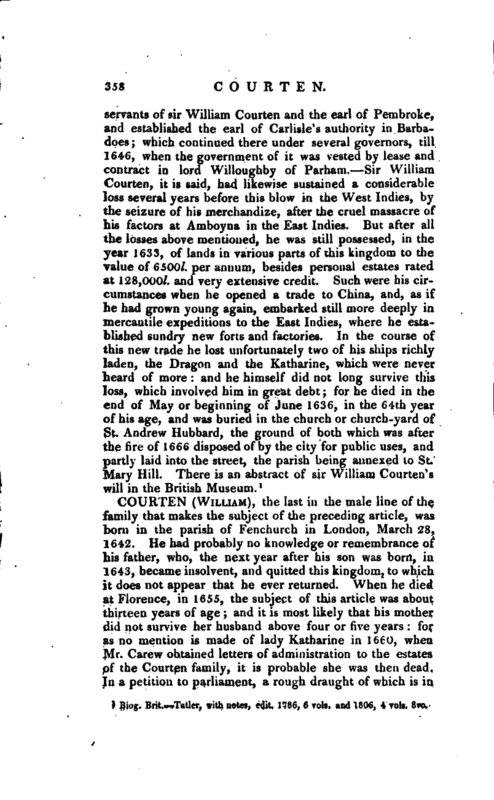 Having previously received a good education in this country, forwarded probably with peculiar care, and earlier certainly than is now usual, William Courten began his travels; or was sent, while yet a minor, to prosecute his studies abroad. The genius of a naturalist, which he discovered, it seems, from his infancy, led him to cultivate it at Montpellier, distinguished then, as Upsal since, for its botanical garden, its peculiar attention to natural history, and the abilities and celebrity of masters in various branches of this science. Here he met, as might be probably expected, with students of a congenial taste, and persons then and afterwards eminent in various walks of literature, with several of whom he appears to have lived in great familiarity, and to have cultivated long correspondence. Tournefort, the celebrated French botanist, was of this number. William Courten, who was the senior by several years, had no doubt made a very considerable proficiency in botany before his acquaintance with this illustrious foreigner commenced; but it must have been much improved by the intimacy that appears to have subsisted | between them. 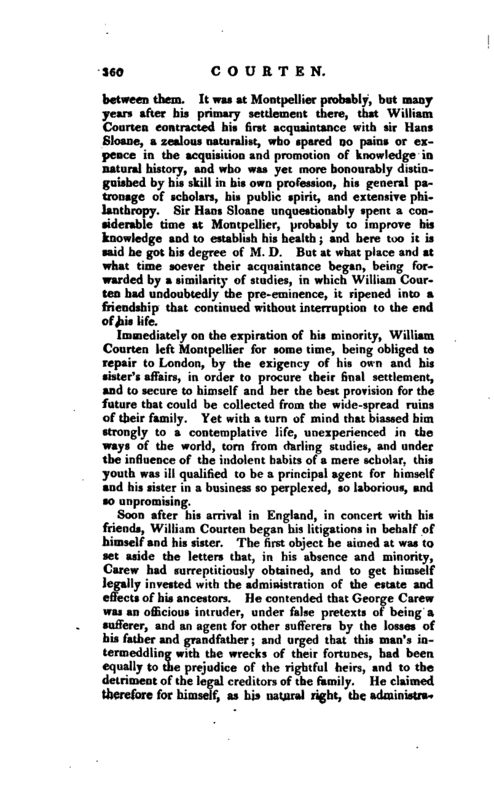 It was at Montpellier probably, but many years after his primary settlement there, that William Courten contracted his first acquaintance with sir Hans Sloane, a zealous naturalist, who spared no pains or expence in the acquisition and promotion of knowledge in natural history, and who was yet more honourably distinguished by his skill in his own profession, his general patronage of scholars, his public spirit, and extensive phiJanthropy. Sir Hans Sloane unquestionably spent a considerable time at Montpellier, probably to improve his knowledge and to establish his health; and here too it is said he got his degree of M. D. But at what place and at what time soever their acquaintance began, being forwarded’by a similarity of studies, in which William Courten had undoubtedly the pre-eminence, it ripened into a friendship that continued without interruption to the end of his life. 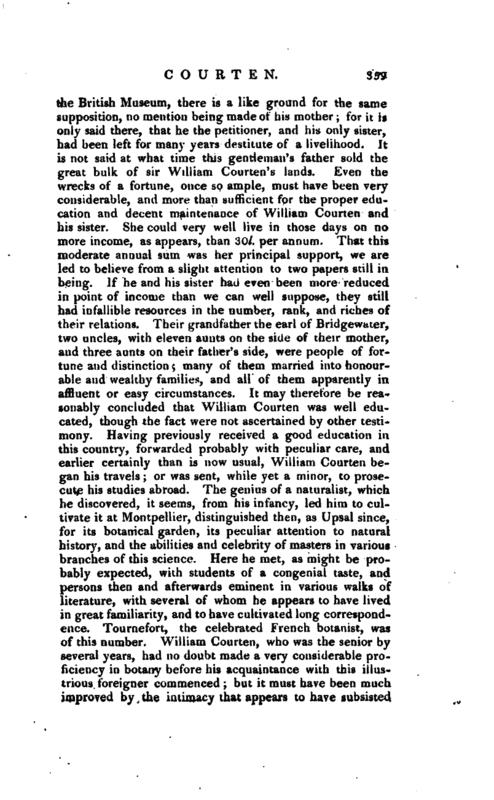 Immediately on the expiration of his minority, William Courten left Montpellier for some time, being obliged to repair to London, by the exigency of his own and his sister’s affairs, in order to procure their final settlement, and to secure to himself and her the best provision for the future that could be collected from the wide-spread ruins of their family. Yet with a turn of mind that biassed him strongly to a contemplative life, unexperienced in the ways of the world, torn from darling studies, and under the influence of the indolent habits of a mere scholar, this youth was ill qualified to be a principal agent for himself and his sister in a business so perplexed, so laborious, and so unpromising. Soon after his arrival in England, in concert with his friends, William Courten began his litigations in behalf of himself and his sister. The first object he aimed at was to set aside the letters that, in his absence and minority, Carew had surreptitiously obtained, and to get himself legally invested with the administration of the estate and effects of his ancestors. He contended that George Carew was an officious intruder, under false pretexts of being a sufferer, and an agent for other sufferers by the losses of his father and grandfather; and urged that this man’s intermeddling with the wrecks of their fortunes, had been equally t > the prejudice of the rightful heirs, and to the detriment of the legal creditors of the family. He claimed therefore for himself, as his natural right, the | administration of the Courten estates and his aunt, lady Knightly, who seems to have been then the only surviving child of sir William, from whom the estates descended, concurred with her nephew in this claim. George Carew, who was both a courtier and a lawyer, seems to have exerted his utmost address and professional skill to stop or frustrate these proceedings. He expressly owns in one of his papers that he had indeed paid indefinite sums of money to William Courten, esq. after he came of age, though he says at the same time that he did not pay the monies because William Courten had a right to them, but solely to prevent and terminate debates. The causes here assigned for the payments to William Courten, esq. 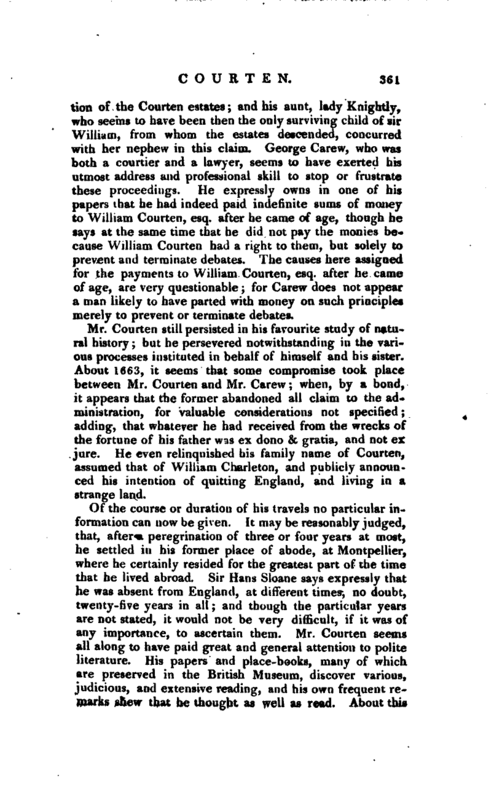 after he came of age, are very questionable; for Carew does not appear a man likely to have parted with money on such principles merely to prevent or terminate debates. 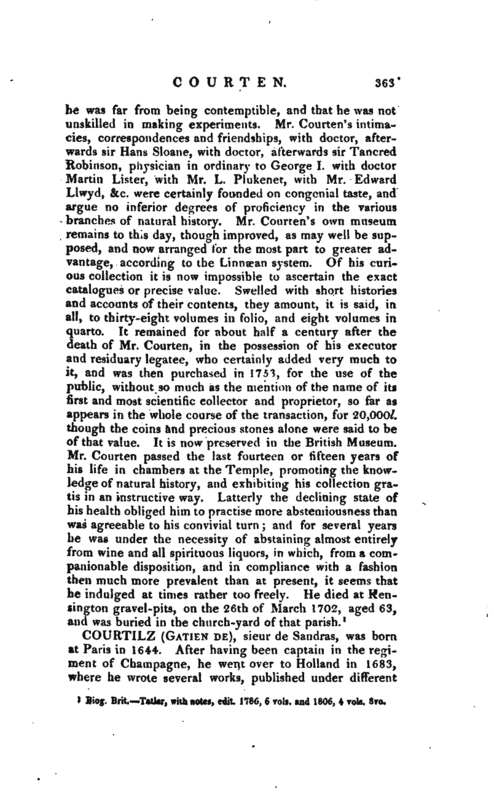 Mr. Courten still persisted in his favourite study of natural history; but he persevered notwithstanding in the various processes instituted in behalf of himself and his sister. About 1663, it seems that some compromise took place between Mr. Courten and Mr. Carew; when, by a bond, it appears that the former abandoned all claim to the administration, for valuable considerations not specified; adding, that whatever he had received from the wrecks of the fortune of his father was ex dono & gratia, and not ex jure. He even relinquished his family name of Courten, assumed that of William Charleton, and publicly announced his intention of quitting England, and living in a strange land. Of the course or duration of his travels no particular information can now be given. It may be reasonably judged, that, after a peregrination of three or four years at most, he settled in his former place of abode, at Montpellier, where he certainly resided for the greatest part of the time that he lived abroad. Sir Hans Sioane says expressly that he was absent from England, at different times, no doubt, twenty-five years in all; and though the particular years are not stated, it would not be very difficult, if it was of any importance, to ascertain them. Mr. Courten seems all along to have paid great and general attention to polite literature. His papers and place-books, many of which are preserved in the British Museum, discover various, judicious, and extensive reading, and his own frequent rejnarks shew that he thought as well as read. About this | time he seems to have been engaged in the study of coins, both ancient and modern. On this entertaining and useful, but expensive branch of knowledge, he certainly made great proficiency, and attained at last extraordinary skill. It appears from one of his pocket-books, that in 1669 he began to collect coins, in both kinds, and in all metals, at considerable expence. 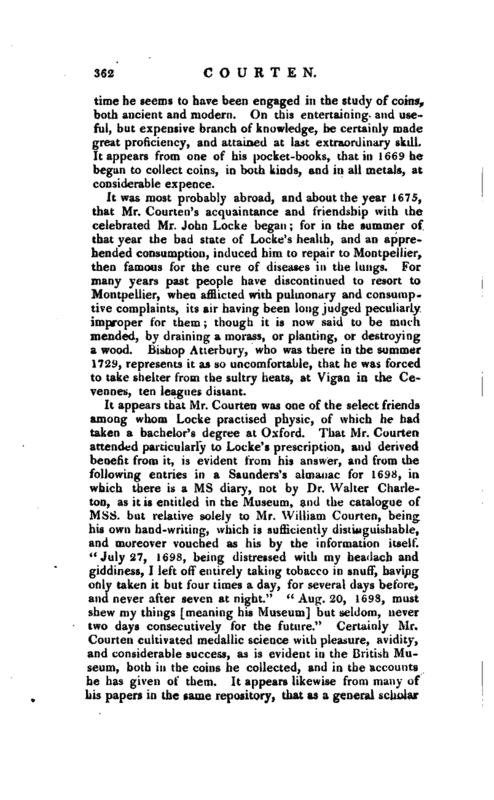 It was most probably abroad, and about the year 1675, that Mr. Courten’s acquaintance and friendship with the celebrated Mr. John Locke began; for in the summer of that year the bad state of Locke’s health, and an apprehended consumption, induced him to repair to Montpellier, then famous for the cure of diseases in the lungs. For many years past people have discontinued to resort to Montpellier, when afflicted with pulmonary and consumptive complaints, its air having been long judged peculiarly improper for them; though it is now said to be much mended, by draining a morass, or planting, or destroying a wood. Bishop Atterbury, who was there in the summer 1729, represents it as so uncomfortable, that he was forced to take shelter from the sultry heats, at Vigan in the Cevennes, ten leagues distant. 1 Bio, Brit. Taller, with notes, edit. 178G, 6 vols. and 1806, 4 vols. 8vo.